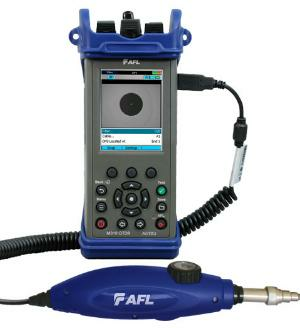 The AFL FLX380 FlexTester3 is the world’s smallest, lightest, most complete single mode fiber optic test set. It combines high-performance, multi-wavelength OTDR/PON OTDR, Source, Power Meter, VFL and PON Power Meter in a rugged, hand-held package. 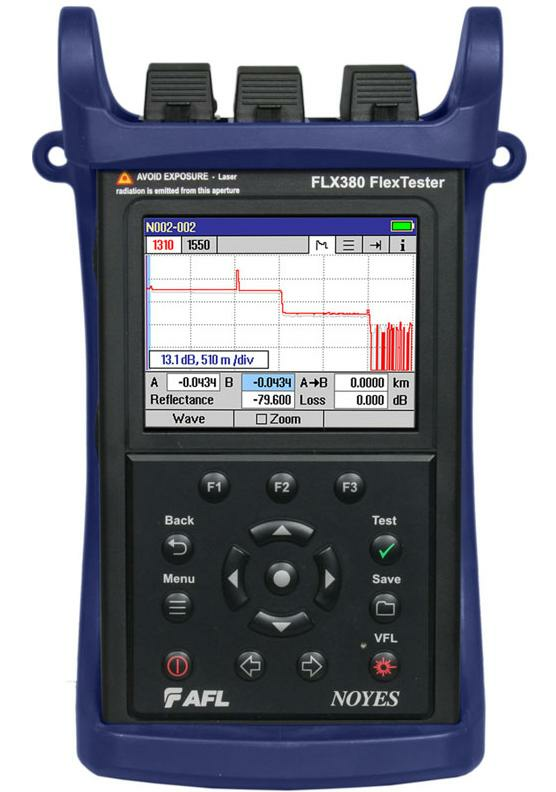 With 42 dB dynamic range, best-in-class event, attenuation, and PON dead zones, LinkMap with pass/fail analysis, macrobend and splitter detection, launch quality check, plus AFL’s unique ServiceSafe® and Wave ID features, the FLX380 FlexTester3 Series offers an unmatched combination of optical test functions, ease-of-use, portability, and value. FlexScan OTDRs enable both novice and expert technicians to quickly and reliably troubleshoot optical networks or fully characterize newly installed or repaired networks. Using FlexScan's innovative SmartAuto mode, multiple OTDR scans quickly and accurately detect, locate, identify and measure network components and faults. 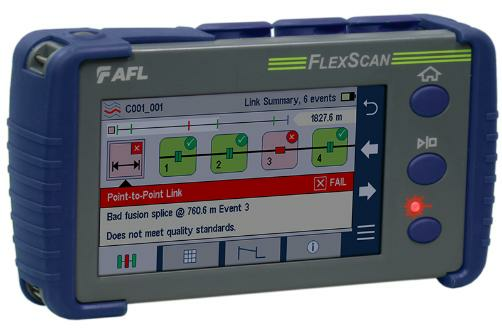 After applying industry-standard or user-set pass/fail criteria, the characterized network is displayed using FlexScan's intuitive, icon-based LinkMap view. 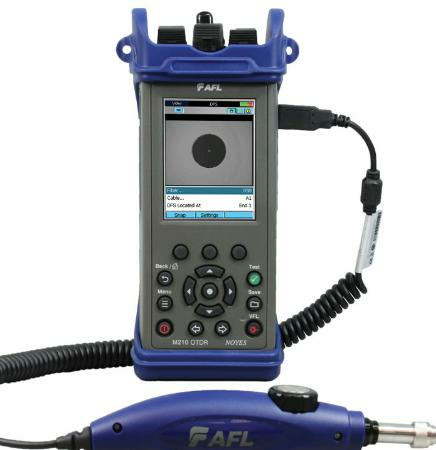 The M210e is the inspection ready OTDR that combines OTDR, OPM and VFL capability with a proven, easy to operate and understand interface. The M210e offers the intuitive Touch and TestTM user interface in a rugged, lightweight, easy-to-hold package ready for field use. Touch and Test simplifies the M210e user experience, minimises human errors and reduces training time by providing one-touch access to the all major functions of the OTDR. The M210e allows setting Pass/Fail thresholds to industry standard TIA/ISO or user-values and automatically alerts users of failing fibers, enabling both experts and novice technicians to complete jobs more accurately and in less time. Rugged, lightweight and easy to hold, the M310 has a Touch and Test user interface that makes it easy for experts and novices to test and document fiber networks accurately and quickly. TruEvent technology enables M310 to provide superior event analysis capability for user to verify and troubleshoot even the most complex fiber network. LinkMap visualizes test results for easy and quick interpretation. With dynamic range up to 38 dB, and 16 hour battery run time, M310 provides complete Tier 1 insertion loss and Tier 2 OTDR testing. Using pre-set Industry ISO/TIA standards or user set Pass/Fail thresholds, technicians are alerted to installation problems and failures in easy-to-interpret event table. Pass/Fail event table and trace are displayed on the same screen for easy correlation. 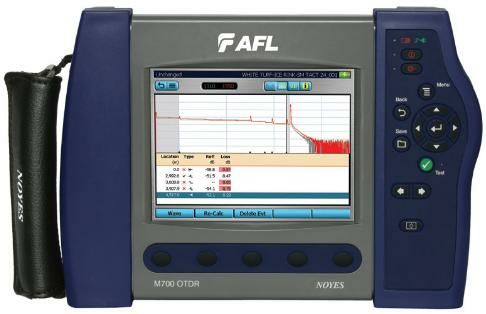 The AFL M710 OTDR from AFL combines ease of use (Touch and Test™) and functionality in a field-rugged, hand-held package. With single-mode dynamic ranges up to 40 dB and multimode dynamic ranges of 26 dB, the M710 OTDR is ideal for testing and troubleshooting LAN/WAN, metro, FTTx and long haul networks. Industry leading dead zones of less than 1.0 m enhance users' ability to locate and measure events. 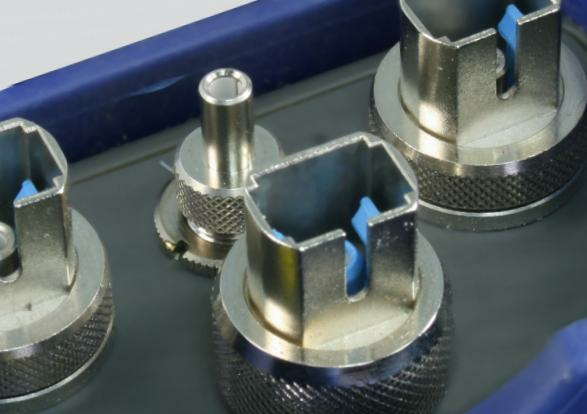 Testing at 1310 and 1550 nm is normally sufficient to certify point-to-point or FTTx PON fibers and allows the detection of macrobends.